If you love fashion but feel intimidated when it comes to putting your own ensembles together, sites that allow you to shop by outfit will offer inspiration and peace of mind. Sometimes if left to your own devices, you won't step outside of your comfort zone and try new things. When you shop by seeing outfits others created online, there are a number of benefits in store. Many options: You can take a single piece you love from a store and pair it with either other things from that particular store, a different store, or see how it could work with something you already have in your closet. New ideas: You can also view a conglomeration of items from different stores paired with the garment or accessory you already know you want. This allows you to branch out into looks you may have never thought of on your own and gives you the nudge you need to experiment more with your fashion choices. Get inspired: If you're not feeling very inspired by your wardrobe lately, the chance to shop by outfit for new ideas will solve your problems. The only downside to having so many great choices alongside the item you already know you want to buy is that you may be tempted to purchase more than you normally would. With willpower (or the permission from yourself to go on an online shopping spree), however, there are very few negatives to shopping by outfit. Fashion creation sites like the following can expand your wardrobe, your style, and encourage you to express your creativity. You can participate and create your own outfits at Polyvore, but that's not all. Once you choose an item you like, you can see how other members of the Polyvore website have styled that particular item. If you like one of their pairings, buying additional items is as easy as clicking on the link that's been provided. If you don't want to center on one specific item, you can choose the Trending option and look at upcoming looks and other collections like Pretty Florals, Boyfriend Shorts, and more. Polyvore does not limit you to just one brand of clothing, so you won't be limited to one store's selection like you will on other sites. 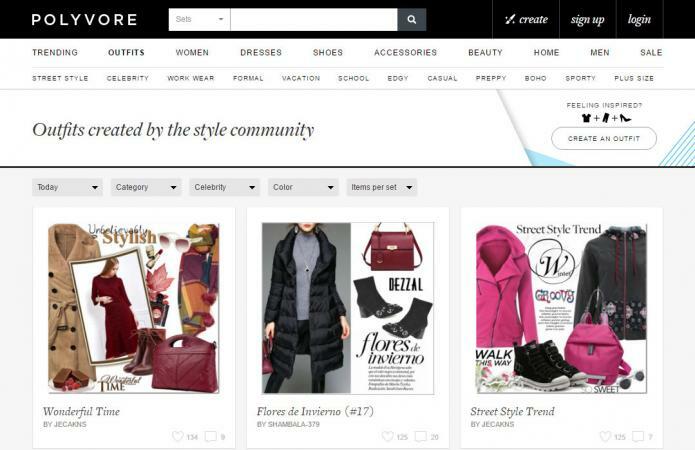 Avenue 7 is a similar site to Polyvore. Users can create and share their combinations, from shoes and lipstick to dresses and cardigans. When you see an item you like, you can click to purchase it as long as the company is still active with the site. You can search for outfits based on popularity, newest, those commented on by friends, and more. Like Polyvore, you'll have several brands and stores at your fingertips. 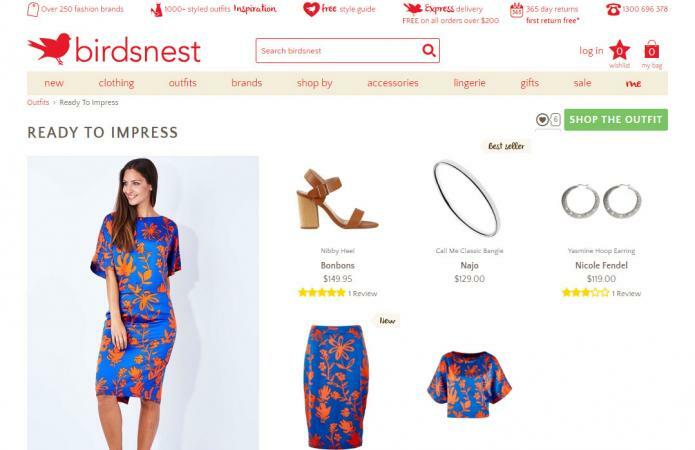 Birdsnest lets you click on a basic outfit, then get recommendations to make it your own from there. You'll see the price for the outfit as well as each recommended piece - as well as any reviews they have - listed on the page. Click on the ones that interest you and add them to your cart. If they're sold out of a specific item, you'll know early in the process and have the option to receive an alert when the item is back in stock. Red Dress Boutique has pre-styled items in a format that makes shopping easy. If you only like the focal point of the outfit, you can purchase that. Or, if you like the outfit as a whole, scroll down to see each component listed separately, click, and add those to your cart. Another advantage is the Model Specs section, which tells you the featured model's height, measurements, and the size she's wearing in the photo. This will help ensure the perfect fit on the first try. Though Forever 21 is best known for catering to the younger set, women can sometimes find items they love at reasonable prices, especially when searching for trendy pieces. You can get the breakdown on several ensembles, and you aren't likely to go broke purchasing a whole look. Check out Forever 21's "Shop the Gram" section, where Instagrammed outfits are broken down into their separate pieces and ready to be purchased. The opportunity to go shopping by outfit, or even to help others shop by creating your own collages on sites like Polyvore and Avenue 7, takes much of the guesswork out of shopping. Get fresh ideas and see things you may have never seen had you not shopped for clothing based on pre-designed outfits.